Just a few days back (November 27), a flash mob hit the financial capital of my country (Mumbai, India). Alarmed? Don’t be. Flash mobs aren’t a mass of people on a rampage, but more of a semi-coordinated gathering of people for the purpose of fun and play. It is usually a spontaneous public performance like a dance or clapping session. Wikipedia has more on this latest social trend. When it comes to a social trend, most of don’t like to left out. Flash mobs are the latest hysterical rage. Though they appear to be unplanned, they are in fact orchestrated with the help of mobile and social media. Facebook and Twitter help to spread the word to the world. Tina’s previous post on What A Flash Mob Is & How You Can Participate What A Flash Mob Is & How You Can Participate What A Flash Mob Is & How You Can Participate Read More touched upon it first. Here we hunt for a few more clues. FMA is an event production and flash mob registration company based out of Los Angeles. They have produced flash mobs for American Red Cross, GLAAD, Heal the Bay, Dell, Oscar Mayer, Suave, Rachael Ray, The Bachelorette, and Modern Family with the motto of ‘Joy thru Surprise’. As an individual you probably won’t be able to hire them for orchestrated public performances, but you can definitely visit their site and register to participate in the next happening flash mob around town. The organization also has a mailing list. This UK site flashes the latest flash mob news from around the world. You can also add your own events by publishing them via the simple form. The site has separate sections for Britain, Europe, Americas, and the world. To stay updated in real time, follow them on Twitter. Really take your search for the next flash mob real time on Twitter. The hashtag #Flashmob seems to be doing the rounds quite frequently. Clicking on People results from the sidebar opens up the Twitter page opens up a whole list of flash mob related Twitter feeds. For instance, I found FlashMob_TV which is a new show for MTV looking for members for their FlashMob. 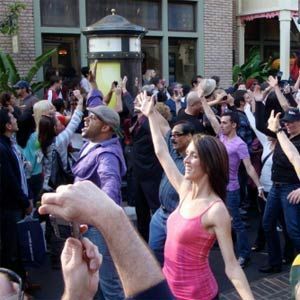 Twitter is a great place to locate localized flash mob events and connect to others who are enthusiasts for a bit of spontaneous fun. I found relatively fewer flash mob related pages on Facebook. There were a few pages of the ilk Flash Mob Addict and a few localized ones for specific cities around the globe. The relative sparseness on Facebook makes me think that Twitter is a better bet when it comes to catching real time updates on where the next flash mob is going to be. Sites like MeetUp.com are also useful for finding out local flash mobs. As the screen above shows, it could connect you directly to local groups involved in organizing impromptu flash mobs. You can setup alert emails to notify you if any new flash mob events start up in your area. Anyone can start a flash mob. All it takes is an original idea and an event to stage it for. Flash mobs can be set up for fun or awareness. You will have better chances of gathering followers if it’s purely for fun as any groupie activity with serious undertones could push people away. The web has umpteen resources on how to go about organizing flash mobs. You can keep on searching the web for more hints and tips, but I think these three should cover it. The best way to learn how it’s all put together is to volunteer to one and learn the ropes from the inside. So, do you think flash mobs are just a social fad and like all fads destined to die out? Or do you think our world could do with more if it? Let us know in the comments. I think flashmobs are proof that humanity should continue. My husband would have loved Bolero. Capital of my country ...ehh. "Financial" capital of my country. It's fun but it could be used to make powerful statements too. "Socio-tainment" could be a powerful force.